We have reached our final preview in the 2015 College Football Preview series here at Sports Enthusiasts. The SEC West, along with the SEC Championship, are in the crosshairs and what a final division we have to look at. Below are all the previews done to this point, so please feel free to check those out. Let’s take a look at the one of the toughest divisions in college football, the SEC West. Les Miles has been wonderful at LSU. In his 10 years, he has won at ten games 7 times and his “worst” year has been an 8-5 recorded in both 2008 and 2014. LSU lost the 2011 BCS Championship to Alabama 21-0 and followed that with back-to-back 10-3 seasons. 2014 was plagued by inconsistency at quarterback and both return in 2015. The offense will have nine starters returning from a group that put 27.6 points and 387 yards per game. Brandon Harris is expected to win the starting quarterback job after throwing for 452 yards with 6 touchdowns and 2 interceptions. He will have Anthony Jennings (1,611 yards with 11 touchdowns and 7 interceptions) behind him if he cannot handle those duties. Leonard Fournette was hyped as the next-coming in 2014 and he finished the year with a solid 1,034 yards and 10 touchdowns while better production is expected of him in 2015. The top four receivers all return, however, their numbers are hardly overwhelming. Travin Dural had 37 catches for 758 yards and 7 touchdowns, Malachi Dupre had 14 receptions for 318 yards and 5 touchdowns, John Diarse caught 15 passes for 275 yards and 3 touchdowns, and Trey Quinn finished with 17 catches for 193 yards. With three starters back on the offensive line as well as better quarterback play in 2015, the offense should produce better numbers than they did last year. LSU’s defense is usually pretty good. 2014 was no exception with the team yielding 17.5 points and 317 yards per game. In 2015, there will be six starters back with two on the defensive line. Those two will be Christian LaCouture (40 tackles and 2.5 sacks) and Davon Godchaux (42 tackles). LSU loses linebacker Kwon Alexander (90 tackles, 1.5 sacks, and 6 tackles for loss), but does have Kendall Beckwith (77 tackles, 2 sacks, and 5.5 tackles for loss) and Lamar Louis (29 tackles) returning. The secondary has two starters back as well with Jalen Mills leading the way (62 tackles, 5 pass breakups, and 1 interception), but he will miss at least the first four weeks due to leg surgery. The other returning starter is Tre’Davious White, who had 33 tackles, 6 pass breakups, and 2 interceptions while Jamal Adams was integral in 2014 with 66 tackles, 1 sack, and 4 tackles for loss. The defense will be stingy again in 2015, especially when Mills returns. LSU has a non-conference schedule of McNeese State (home), Syracuse (road), Eastern Michigan (home), and Western Kentucky (home), which makes them very likely to go 4-0 in those games. In their division, they will face Mississippi State, Alabama, and Ole Miss on the road in three very tough games while playing Auburn, Arkansas, and Texas A&M at home. From the East, they will play South Carolina (road) and Florida (home) in two winnable games. The games against Alabama on November 7, Arkansas on November 14, and Mississippi on November 21 are sure to determine whether LSU wins the SEC West. 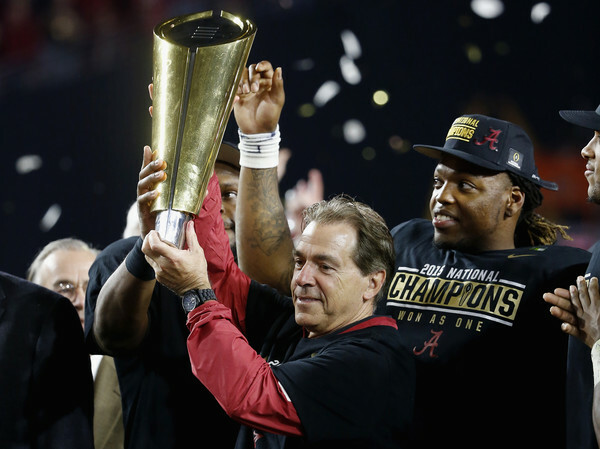 We all know that Nick Saban has been great at Alabama. After a 7-6 record in his first year during the 2007 season, Alabama has won at least 10 games every year since 2008. He has won three SEC Championships as well as three National Titles for the Crimson Tide. The one concern (if you can call it that) is the defense has given up 45 points and 42 points, respectively, in the past two years during the Sugar Bowl. Alabama lost both of those games including last year when they were eliminated the College Football Playoff Semifinals by eventual national champion Ohio State. The offense put up 36.9 points and 485 yards per game in 2014 with Lane Kiffin at the helm, but 2015 will be interesting with only three starters returning. Jake Coker will be at quarterback after throwing for 403 yards with 4 touchdowns and no interceptions last year, but has plenty of talent after battling Jameis Winston when he was at Florida State. Derrick Henry was the top running back in 2014 with 990 yards and 11 touchdowns in a deep backfield while Kenyan Drake (112 yards and 4 touchdowns) is back after a broken leg last year. The biggest loss was at wide receiver with Amari Cooper (124 catches for 1,727 yards and 16 touchdowns) going on to the NFL. There is a lot of talent here (Robert Foster, Calvin Ridley, Daylon Charlot) and a bit of experience in OJ Howard (17 catches for 260 yards), Chris Black (15 catches for 188 yards), and ArDarius Stewart (12 catches for 149 yards), but that production will be impossible to replace. There will also be only two starters back on the line so the work will be cut out for Saban and Kiffin. It is hard to see the offense producing the same numbers in 2015 as they did in 2014. The defense is almost always spectacular under Saban. Their worst year since 2008 was actually last year when they allowed 18.4 points and 328 yards per game, which is still a very good season. Seven starters are back in 2015 including all three on the defensive line. Jonathan Allen had 33 tackles, 5.5 sacks, and 6 tackles for loss, A’Shawn Robinson had 49 tackles and 6.5 tackles for loss, and Jarran Reed had 55 tackles, 1 sack, and 5.5 tackles for loss. Returning at linebacker will be the duo of Reggie Ragland (95 tackles, 1.5 sacks, and 9 tackles for loss) and Denzel Devall (11 tackles) who made seven starters and was out with injury for six games. The secondary is led by Cyrus Jones, who had 46 tackles, 13 pass breakups, and 3 interceptions. Also returning in the secondary is Eddie Jackson (41 tackles, 6 pass breakups, and an interception). Look for another big year from the defense that could have even better numbers than they had in 2014. 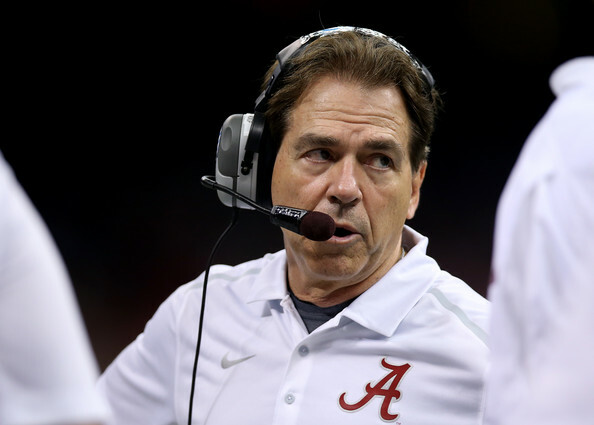 Alabama opens the year with the tough neutral site game against Wisconsin in Arlington, Texas. They will also face the trio of Middle Tennessee, Louisiana-Monroe, and Charleston Southern at home to close out their non-conference schedule. They will have to play Ole Miss, Arkansas, and LSU at home while facing Texas A&M, Mississippi State, and Auburn on the road. From the East, Alabama will play Georgia (road) and Tennessee (home). The offense is the obvious concern for Alabama, but their defense should be good enough to keep them in every game while the offense finds its feet. Ole Miss went 4-8 in 2010 and 2-10 in 2011 in Houston Nutt’s last two years. They decided to bring in Hugh Freeze, who has steadily turned around the Rebels. He paid immediate dividends by taking the Rebels to a bowl game in his first season and then went 8-5 in 2013. 2014 was a really good season for them with a 9-4 record including a 23-17 victory over #4 Alabama at home, but were blown out by an excellent (and angry) TCU squad in the Peach Bowl. The offense has been good under Freeze in all three seasons. In 2013, they put up 30 points and 473 yards per game while those numbers dropped a bit in 2014 to 28.3 points and 419 yards per game. There will be nine starters back for Ole Miss this year, but quarterback Bo Wallace is gone. The good news for the Rebels is they have Clemson transfer Chad Kelly ready to take over immediately after a year in the junior college ranks. They will also have the top two running backs from last year in Jaylen Walton (586 yards and 5 touchdowns) and Jordan Wilkins (361 yards and a touchdown). The receiving unit looks to be in good shape even without their top man from 2014. Evan Engram (38 catches for 662 yards and 2 touchdowns), Cody Core (41 receptions for 558 yards and 6 touchdowns, and, of course, the return of LaQuon Treadwell (48 catches for 632 yards and 5 touchdowns). The entire offensive line returns and despite the loss of Wallace, the offense should be able to put up good numbers again in 2015. The defense was very good in 2014 by giving up only 16 points and 329 yards per game. Seven starters will be back from that defense led by the trio of Robert Nkemdiche (35 tackles, 2 sacks, and 2 tackles for loss), Isaac Gross (37 tackles, 1 sack, and 7 tackles for loss), and Marquis Haynes (31 tackles and 7.5 sacks) on the line. Also in the mix on the line are junior college transfer DJ Jones, redshirt freshman Breeland Speaks, and senior Channing Ward (30 tackles and 2.5 sacks). CJ Johnson is back at linebacker (38 tackles, 4 sacks, and 4 tackles for loss) and will be joined by Denzel Nkemdiche (28 tackles and 1 sack), who missed the final five games of the year due to a broken ankle. The secondary will have three starters back led by Tony Conner (69 tackles, 1 sack, 8 tackles for loss, and an interception), Mike Hilton (71 tackles, 4 tackles for loss, 7 pass breakups, and 3 interceptions), and Trae Elston (59 tackles, 3 tackles for loss, and an interception). The defense will be good again in 2015, but may not match the same numbers from 2014. Ole Miss has an easy non-conference schedule with Tennessee-Martin, Fresno State, and New Mexico State at home and a single road game at Memphis. In division, they face Alabama, Auburn, and Mississippi State on the road and Texas A&M, Arkansas, and LSU at home. From the East, Ole Miss will take on Florida (road) and Vanderbilt (home). The Rebels will have a really good shot at a double digit win season and are in contention for the SEC West title. Bret Bielema came to Arkansas in 2013 and the Razorbacks had a rough first year under him. They went 3-0 to start the season, but lost the final nine games. However, the final three games saw an improved Arkansas team that nearly upset #15 LSU on the road as a 26 point underdog. 2014 was better with Arkansas going 6-6 in the regular season including back-to-back upset shutouts of LSU (17-0) and Ole Miss (30-0). They also nearly upset Alabama at home and lost by a touchdown to the trio of Texas A&M, Mississippi State, and Missouri. The offense for Bielema will have nine starters back. In 2013, they averaged only 20.7 points and 357 yards per game while 2014 saw the numbers improve to 31.9 points and 406 yards per game. Brandon Allen is back after throwing for 2,285 yards with 20 touchdowns and 5 interceptions, but the focus will be on the running game. There are four starters back on the offensive line to pave the way for the Alex Collins. Collins had 1,100 yards and 12 touchdowns on the ground in 2014, which was second the team. The top rusher was Jonathan Williams, who had 1,190 yards and 12 touchdowns, but will miss all of 2015 due to surgery on his foot. The top two receivers are back in Keon Hatcher (43 catches for 558 yards and 6 touchdowns) and Hunter Henry (37 catches for 513 yards and 2 touchdowns). If a viable second back can be developed behind Collins, the Arkansas offense could be really dangerous, but at the least they should be able to match year’s numbers. The defense took a major step forward in 2014 when compared to 2013. In 2013, the defense gave up 30.8 points and 413 yards per game while the numbers plummeted to 19.2 points and 323 yards per game last year. There will be six starters back with two on the line in JaMichael Winston (26 tackles) and Taiwan Johnson (26 tackles, 4.5 sacks, and 3.5 tackles for loss). The line gave up only 115 yards rushing per game and 3.5 yards per carry. The linebackers will have only Brooks Ellis back, but he was second the team in tackles with 72 while also recording 5 tackles for loss, 5 pass breakups, and 2 interceptions. The secondary returns mostly intact with three starters back with the trio of Jared Collins (53 tackles and 13 pass breakups), DJ Dean (29 tackles, 5 pass breakups, and 2 interceptions), and Rohan Gaines (59 tackles, 5 pass breakups, and 1 interception). The defense should be stout again in 2015. Arkansas opens the season with games against UTEP, Toledo, and Texas Tech with all those games in the state of Arkansas. They also face Tennesssee-Martin at home in October. They will face Texas A&M in Arlington as well as Alabama, Ole Miss, and LSU on the road. They will play at home against Auburn and Mississippi State and take on Tennessee (road) and Missouri (home) from the East. Arkansas’ games against Alabama and LSU both fall on the road, but they are dangerous team in the West. Auburn won the BCS National Championship in 2010, but quickly fell to 8-5 in 2011 and then 3-9 in 2012. 2013 saw Gus Malzahn come in and nearly win another National Championship for Auburn, but they lose to Florida State in the BCS Championship 34-31. They went to 8-5 last year and are hoping to bounce back to another double digit win season in 2015. The offense has only four starters back from a group that put up 35.5 points and 485 yards per game in 2014. Of course, Gus Malzahn is known for his offenses and he will have Jeremy Johnson slinging the ball around. Johnson threw for 436 yards and 3 touchdowns while starting the first half of the opener against Arkansas. He will have three of the top five receivers from 2014 led by Duke Williams, who had 45 catches for 730 yards and 5 touchdowns. Also back are Ricardo Louis (21 catches for 261 yards and 3 touchdowns) and Melvin Ray (8 catches for 182 yards and a touchdown). The top running back in 2014 was Cameron Artis-Payne (1,608 yards and 13 touchdowns), but he has moved on to the NFL. He will be replaced by Jovon Robinson and Roc Thomas (214 yards and 2 touchdowns). There are three starters back on the offensive line to give Johnson some time as well as create lanes for Robinson and Thomas. The offense will be just fine in 2015 despite only four starters back. The defense will have eight starters back from a unit that allowed 26.7 points and 399 yards per game. The defensive line will have DaVonte Lambert (24 tackles, 3.5 sacks, and 3.5 tackles for loss) and Montravius Adams (43 tackles, 3 sacks, and 5 tackles for loss) back. The Buck position will be handled by Carl Lawson (out for 2014) and Gimel President (30 tackles, 1 sack, and 4 tackles for loss). At linebacker, the duo of Cassanova McKinzy (91 tackles, 1.5 sacks, and 9.5 tackles for loss) and Kris Frost (87 tackles, 3.5 sacks, and 6.5 tackles for loss) returning. The secondary will have three starters returning led by Johnathan Ford, who had 93 tackles and 3 interceptions last year. Also returning is Jonathan Jones, who was a ball hawk in 2014 with 11 pass breakups and 6 interceptions to go along with 36 tackles. The defense should be very solid in 2015. Auburn opens the season with a neutral site game in Atlanta, Georgia against Louisville. They will also face Jacksonville State, San José State, and Idaho at home for their other non-conference games. Auburn will have to play LSU, Arkansas, and Texas A&M on the road while taking on Mississippi State, Ole Miss, and Alabama at home. From the East, the Tigers play Kentucky (road) and Georgia (home). While it is hard to pick the Tigers this low, they are not without a chance to win the West. Kevin Sumlin came to Texas A&M in 2012 with two things against him: his first year in charge and the Aggies’ first year in the SEC. He did quite well by going 11-2 overall including the marvelous 29-24 upset of #1 Alabama in Tuscaloosa. 2013 saw them slip slightly to 9-4 while they went 8-5 in 2014. 2015 will be Sumlin’s fourth year and he has some serious quarterback prospects in his stable. The offense was a bit underwhelming in 2014 by Sumlin’s standards. They averaged 35.2 points and 455 yards per game, which is great for most teams, but it was nearly 10 points and 100 yards per game than in 2013. Kyle Allen will be at quarterback after getting some playing time in 2014 when he threw for 1,322 yards with 16 touchdowns and 7 interceptions. He will be throwing to Josh Reynolds (52 catches for 842 yards and 13 touchdowns), Speedy Noil (46 catches for 583 yards and 5 touchdowns), Ricky Seals-Jones (49 catches for 465 yards and 4 touchdowns), and Edward Pope (30 catches for 454 yards and 4 touchdowns). Tra Carson was the top running back in 2014 with 581 yards and 5 touchdowns and returns alongside Brandon Williams (379 yards and 3 touchdowns). Three starters are back on the offensive line and the numbers should go up for the offense in 2015. The defense will have eight starters back in 2015 from a group that allowed 28.1 points and 451 yards per game. The trio of Daeshon Hall (29 tackles and 4.5 sacks), Hardreck Walker (35 tackles), and Alonzo Williams (57 tackles and 4.5 sacks) will be returning on the line. The linebackers were hit hard, but the hybrid spot, Rush, will be manned by Myles Garrett, who had 53 tackles and 11.5 sacks. Only Shaan Washington returns at one of the traditional linebacker spots after recording 64 tackles, 2 sacks, and 2 tackles for loss last year. The secondary has De’Vante Harris (53 tackles and 1 interception) and Armani Watts (59 tackles, 8 pass breakups, and 3 interceptions) back. It is hard to imagine the defense not improving in 2015 with the amount of experience returning. Texas A&M opens the year with Arizona State in Houston, Texas. After that, they will play Ball State, Nevada, and Western Carolina at home in their non-conference schedule. In division, they have to take on Arkansas in Arlington, Texas before playing Mississippi State, Alabama, and Auburn at home. They will play both Ole Miss and LSU on the road. From the East, they have the duo of South Carolina (home) and Vanderbilt (road) in two winnable games. The Aggies are immensely talented and will have a better offense, which makes it tough to put them this low. They do have a chance to make noise in the West and make the SEC Championship game. Dan Mullen has been pretty consistent since taking over Mississippi State in 2009. They went 5-7 in that first year, but have made five straight bowl games since then and have also had a winning season each year since 2010. 2014 was nearly a magical season for MSU, as they opened 9-0 before losing three of their last four games. Their two regular season losses were on the road to Alabama and Ole Miss and were then walloped in the Orange Bowl, 49-34. 2015 looks like a rough year with only seven total starters returning. The offense will have four starters back from a group that put up 36.9 points and 514 yards per game in 2014. The good news is that quarterback Dak Prescott is one of those returning after throwing for 3,449 yards with 27 touchdowns and 11 interceptions while also rushing for 986 yards and 14 touchdowns. Prescott will be leaned on heavily all season with the top returning running backs in Brandon Holloway (294 yards and 1 touchdown) and Ashton Shumpert (274 yards and 2 touchdowns). The top two receivers also return with De’Runnya Wilson (47 catches for 680 yards and 9 touchdowns) and Fred Ross (30 catches for 489 yards and 5 touchdowns) leading the way. There will be only two starters back on the line as well. Despite just four starters returning, they are in a good spot with the quarterback and top two receivers back, but it will be tough for them to match last year’s output. The defense has only three starters back from a unit that allowed 21.7 points and 424 yards per game. Ryan Brown is the lone returning starter on the line after recording 39 tackles, 3.5 sacks, and 3.5 tackles for loss. He will be joined by Chris Jones (26 tackles and 3 sacks) and AJ Jefferson (28 tackles, 2.5 sacks, and 4.5 tackles for loss). At linebacker, Beniquez Brown is back after recording 62 tackles (#2 on team) along with 2 sacks, 5 tackles for loss, and 2 interceptions. Richie Brown saw playing time in every game in 2014 and recorded 50 tackles and 3 interceptions as well. The secondary has just Taveze Calhoun (53 tackles, 9 pass breakups, and 1 interception) back at starter, but Will Redmond had a solid year as well with 51 tackles, 5 pass breakups, and 3 interceptions. It will be hard for the Bulldogs to have as good a year as they did in 2014 on the defensive side of the ball. MSU will have Southern Miss on the road to start their non-conference slate, but finish up with Northwestern State, Troy, and Louisiana Tech at home. In conference, they will play Auburn, Texas A&M, and Arkansas on the road while taking on LSU, Alabama, and Ole Miss at home. From the East, they will play both Kentucky (home) and Missouri (road). In a very deep SEC West, it is tough to put the Bulldogs down here with Dak Prescott returning as well as Dan Mullen at the helm. At the very worst, MSU should be back in a bowl game for 2015, but can cause some serious problems for the other teams in the West. How difficult is it to predict the SEC West? All seven teams made a bowl game in 2014 and all seven teams have a legit chance at winning the division this year. If you are a fan of one of the teams picked at the bottom, do not fret because this was the hardest preview to write given the quality and depth of all the teams. The predicted order of finish below is sure to be wrong, but that is a testament to the SEC West. For the SEC Championship, we had Tennessee winning the SEC East to set up a contest against LSU, the winner of the SEC West. If that were to be the SEC Championship, we will go with LSU to capture yet another for the West Division, which would be the 7th straight against the East. That concludes the 2015 College Football Preview here at Sports Enthusiasts. Be sure to check back for more news and information regarding all the divisions in College Football, but also for standings and schedules. Mississippi State offensive lineman Elgton Jenkins has been arrested for a warrant on simple assault charges. Jenkins was booked and released on bond Thursday from Oktibbeha County jail in Mississippi. There has been no comment from Mississippi State regarding the arrest of Jenkins. 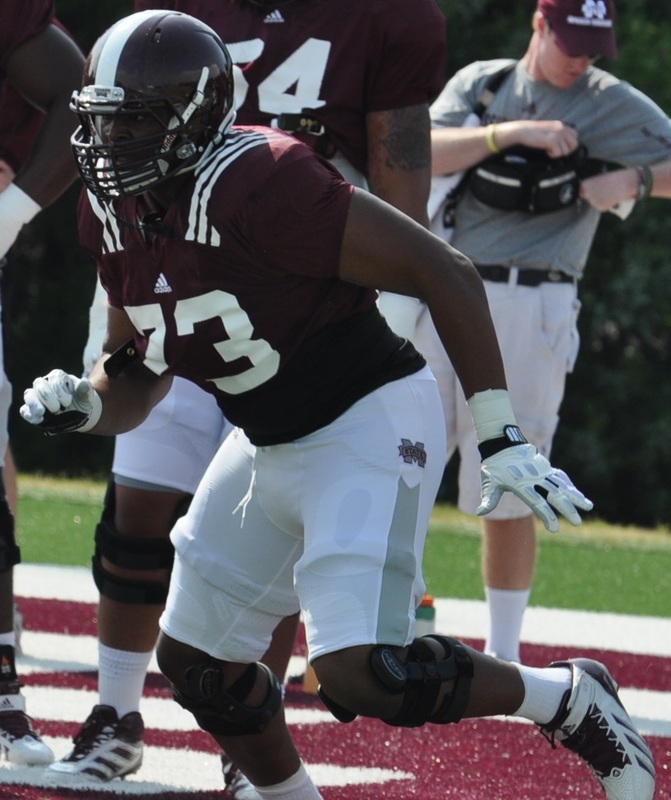 Jenkins is from Clarksdale, Mississippi and redshirted in 2014. This is the third separate incident involving a Mississippi State Bulldog in the last week. Quarterback Dak Prescott was assaulted in Panama City Beach, Florida while on spring break. Fellow teammates Damian Williams and Torrey Dale were also assaulted. Then came the news that wide receiver De’Runnya Wilson was arrested in Alabama on possession of marijuana and drug paraphernalia on Friday night. Mississippi State being spring practice on Wednesday with the hope that this spate of off the field instances are behind them. Mississippi State’s top receiver De’Runnya Wilson was arrested on Friday night during a traffic stop in Alabama. He was booked in jail after a police dog detected drugs. Wilson has been charged with second degree possession of marijuana and possession of drug paraphernalia. Wilson was arrested with three other men and all four were booked on $2,500 bond. 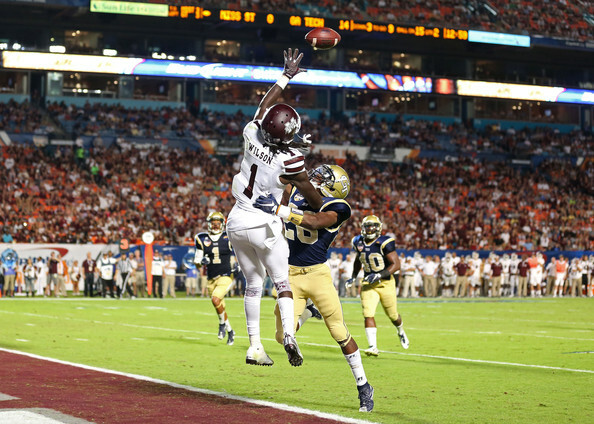 Wilson emerged as the top receiving threat for the Bulldogs in 2014 after impressing in 2013. During the 2013 season Wilson caught 26 passes for 351 yards and 3 touchdowns in 13 games. In 2014, Wilson played in 12 games with 47 catches for 680 yards and 9 touchdowns. He led the team in all three of those categories. He will be a junior in 2015. He is the fourth Mississippi State player to make headlines this week after Dak Prescott, Damian Williams, and Torrey Dale were attacked at a concert in Panama City Beach, Florida on Monday. Prescott is not pressing any charges at this time. Mississippi State begins spring practice this Wednesday.